A hurricane's fury can be relentless, from frightening winds, to torrential rains and flooding. These storms also create enormous ocean waves that are hazardous to ships. And through storm surges of up to 30 feet the storms can demolish shoreline structures, erode beaches and wash out coastal roads. As part of its activities to better understand Earth’s dynamic climate, NASA research is helping to increase knowledge about the behavior of hurricane waves. The NASA Scanning Radar Altimeter (SRA), designed to take measurements of the changing wave height and structure in and around hurricanes, flew through many storms on a National Oceanic and Atmospheric Administration (NOAA) WP-3D aircraft from 1998-2005. It captured unprecedented details on wave behavior that are helping improve sea height forecasts. Strong storms like Hurricane Bonnie in August 1998 - the first to be monitored by SRA - were found to produce severe ocean waves and dramatic changes in wave height and complexity over small distances. The SRA measures waves by sweeping a radar beam across the ocean and measuring the distance to the sea at many points. Those distances are then subtracted from the aircraft altitude to produce a sea-surface elevation map that is displayed on a monitor in the aircraft. 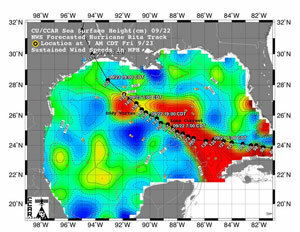 While the flight portion of the SRA hurricane research program concluded with the 2005 hurricane season, the data gathered continue to help researchers develop and improve ocean wave computer models that simulate hurricane-generated ocean wave height, dominant wavelength, and wave direction. These computer models allow wave behavior to be predicted at times and places where there are no observations. 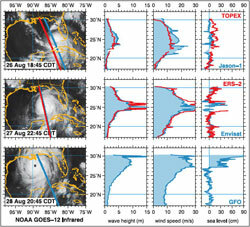 However, actual observations from SRA are essential because "they tell us how the wave field - the height, length and direction of waves in a given area – actually varies with a hurricane's wind speed, size, and forward motion so that we can improve the performance of the models that disaster managers and structural engineers rely on for guidance," said C. Wayne Wright, NASA Wallops Flight Facility, Wallops Island, Va. Ongoing research efforts have shown that ocean wave height responds rapidly to changes in a storm's wind speed. But scientists believe the overall wave field is also driven by the size or radius of a storm's strongest winds, and its forward speed. In Hurricane Katrina in August 2005 the largest waves, up to 40 feet, were found near the strongest winds. In September 2004, scientists with the Naval Research Laboratory-Stennis Space Center, Bay St. Louis, Miss., measured a record-size ocean wave - a whopping 91 feet - when the eye wall of Hurricane Ivan passed over sensors in open water over the Gulf of Mexico. 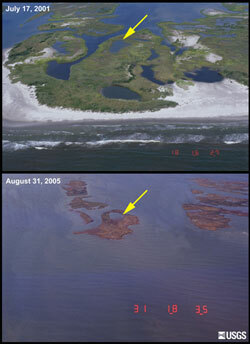 "Ocean depth is another critical factor in wave height," said Edward Walsh, NASA Wallops Flight Facility, Wallops Island, Va. "Our observations from Hurricane Bonnie indicated that as soon as the waves encountered the continental shelf - the underwater extension of the coastal plain - their length began to shorten and they became steeper. As the water became shallow, wave height plummeted." Similarly, with Hurricane Rita in September 2005, the wave height dropped dramatically and was only 9 feet when wave energy was lost due to the shoaling of water on the continental shelf - the process in which waves coming into shallow waters are slowed by friction and become closer together and steeper. Fortunately, a storm's most massive waves usually decrease in size when they interact with the ocean's continental shelf and other land forms, like "barrier islands" that form a thin protective wall between the open sea and the mainland. The islands absorb the strongest waves, sheltering the mainland during large storms. But with powerful storms like Katrina, the constant battering of waves can take a toll on the land, leaving the islands reduced or gone altogether. SRA's detailed and precise information, together with data to be gathered by a new operational SRA being built by NOAA to replace the NASA prototype, promises to provide additional insight into a hurricane's behavior. Such research is increasingly important as areas become more prone to higher storm surges as natural defenses like barrier islands and wetlands disappear.